Udupi, Mar 21 2016: A Young married woman allegedly committed suicide in police quarters on Monday Mar 21. Nandini’s aunt Sakamma was staying with the couple from last 20 days. Early Monday morning Nandini locked herself in her bedroom and hanged herself. 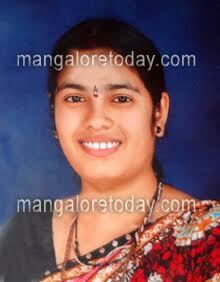 Venkatesh able to broke the door and saw her hanging, she was taken to hospital but she was dead. Reason behind the suicide is not known Udupi town police have registered the case. Taking extreme step is not the end of all problems.